I’m sure that quote will garner its fair share of “amens,” especially among the political right. However, I expect most of those “amens” will be predicated on the supposition that it’s “the other guy” who has tolerated ignorance, recklessness and corruption in Congress by his vote for, and support of, “the other party.” You might want to hold up on passing judgment just yet, and look at some numbers first. Over the past 20 years, Republicans have held the majority in Congress 65% of the time, leaving the Democratic Party a relatively disenfranchised and powerless entity that only wielded control of Congress 35% of the time. If this were professional football, the Democrats would have a 6 and 10 record – pretty much time to fire the coach, sell the team and pack it in. So if, in the words of President Garfield, Congress has been ignorant, reckless and corrupt over the past two decades, it is because the Christian-conservative-right has tolerated ignorance, recklessness and corruption by electing, and reelecting, a party of pachyderms that has perpetually increased the size of government, increased spending, increased the national debt, funded the welfare state, funded the warfare state, funded the police state, funded the healthcare state, never defunded a single unconstitutional or extra constitutional bureau, agency or program, and has generally disregarded the rule of law under the Constitution. I believe if President Garfield were here today, he would admonish us to declare our independence from political parties, powers and leaders that obviously do not represent our values. When we continue to support, or affiliate with such entities, we become parties to, and responsible for, the ignorance, recklessness and corruption that we authorize by our vote. It is time for “those who represent the enterprise, the culture, and the morality of the nation” to withhold their time, their treasure, and their vote from any who are not clearly and consistently “intelligent, brave and pure,” as President Garfield put it. 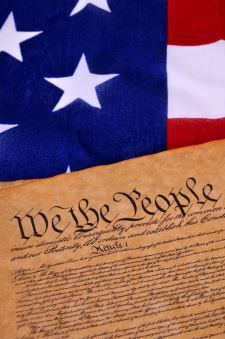 It is far past the time that we ought to have declared our independence from the established forms of political association that have become destructive of the ends for which they were established, and that we should begin to vote not for party, but for principle, and for men of character who Honor God, Uphold the Constitution and Contend for Liberty. Click here to return to main Platform and Resolutions page. Nevertheless, the conservative right seems to be once again getting aroused with hope, this time the hope that something good will come of replacing Boehner. Meanwhile, the current Presidential circus, and infatuation with Donald Trump, would seem to indicate that we like being fooled and are ready to buy a ticket for another elephant ride. I don’t mean this as discouraging negativism in the vein of “nothing will ever get any better; there’s no hope; let’s all sing another chorus of ‘Gloom, despair and agony on me.” What I do mean is that nothing is going to get any better until we start paying attention, determine to not get fooled again and realize that to change our government we have to change our vote. Read the Washington Times article about Boehner’s resignation here. Illegal Immigration — Who’s Responsible? Illegal immigration into the U.S. has been on the rise for the past year, but in the last month or so an unprecedented wave of immigrants has hit the border and started to make headlines. In California, citizens took to the streets to physically block buses from bringing more illegals into their community. Texas Governor, Rick Perry, is said to be preparing to deploy National Guard forces. Rumors are flying about various citizen militia groups heading south to secure the border. Meanwhile, the U.S. Customs and Border Protection agency has begun a million-dollar ad campaign across Central America warning potential illegal immigrants of the dangers of the journey and that there will be “no permiso” – no permission to stay – once they get to the border. General John Kelly, Chief of the U.S. Southern Command, calls the region a “Crime-terror convergence” that is an existential threat to the nation. Though the subject of illegal immigration has gained new attention through the recent and somewhat exceptional events, the issue itself and the general factors surrounding it are nothing new. The number of illegal aliens in the U.S. has been on the rise for a half century, including throughout the Bush administration, arriving at a record high in 2007 of nearly 11.8 million. The number had since declined slightly, but now appears to be on the rise again. While nothing justifies entering someone else’s country uninvited, it is also true that nothing happens in a vacuum. So long as the law of cause and effect is in place, there will be reasons why things happen and factors that contribute to it. We can’t honestly expect to fix the illegal immigration problem until we understand and address those contributing factors. Welfare use by immigrants, legal and illegal, is about double that of native-born Americans. However, employment levels are about on par. It would appear that illegal aliens are as willing to work as the native citizens are, but are paid less and use more social service programs to make up the difference. The presence of such programs that supplement low income provides considerable incentive for illegals to come to America. Welfare has also helped to create the job opportunities that illegals come here to fill. George W. Bush, a proponent of amnesty, indicated that we need the illegal aliens because they do the jobs “Americans won’t do.” But who did those jobs before the 1970’s when illegals really began to come here in earnest? The answer is that until the Great Society welfare state sprang up in the 1960’s and began to pay us not to work, those jobs were, for the most part, done by Americans. As a result of the welfare system that pays people not to work, we really do need illegal aliens who are willing to do the jobs that we are paying Americans not to do. To get a feel for the difference in economic conditions, I looked up the annual gross domestic product (GDP) per capita in both the U.S. and the four countries immediately to our south. In the United States, there is $54,980 of GDP available per person. In Mexico, there is $16,111 of GDP available per person, in El Salvador $7,549, Guatemala $5,208 and Honduras has only $4,700 available per person. In other words, the inhabitants of the four neighboring countries to our south are living on from 9% to 29% of what U.S. residents are. My friend, Constitution Party Vice Chairman, Randy Stufflebeam, recently participated in a television documentary on illegal immigration that took him to Mexico and El Salvador. Randy found that nearly everyone there both knew what the North American Free Trade Agreement (NAFTA) was and blamed it for much of their economic woe. It appears that many family farmers have found themselves unable to make a living growing food crops since the implementation of NAFTA and have resorted to growing marijuana as the new cash crop. Watch this presentation that Randy recently gave to find out what else he learned while south of the border. Honduras, El Salvador and Guatemala, the three countries now propelling the greatest number of illegal immigrants toward the U.S. southern border, have the first, fourth and fifth highest homicide rates in the world with Honduras now at 90 homicides per 100,000 as compared to the U.S. rate of less than 5. In San Pedro Sula, Honduras, where the homicide rate has reached 180 per 100,000, The Guardian reports that survival depends on knowing the rival gang boundaries, seeing and saying as little as possible and paying the “war taxes” the gangs extort from businesses and the “protection taxes” levied on family homes. This issue also ties back to the topic of welfare. A considerable portion of the tax dollars that are spent on welfare programs end up either directly or indirectly supporting the drug trade. Just ask your friendly neighborhood drug dealer how much his revenue stream jumps on the day the welfare checks come out. Talk of an amnesty plan that will allow illegals who are already in the country to remain, is no doubt prompting many to try to get across the border in time to get in on the deal. Some are blaming the recent surge on President Obama for stirring up immigrants’ hope of getting a free pass through his talk about the DREAM act. This of course is to be expected as President Bush’s 2004 push for amnesty was also followed by a surge in illegal border crossings. Fuel is poured on the illegal immigration fire when House Republican leadership is also pushing for amnesty. When deportation goes down, hope of getting in and managing to stay goes up. The Obama administration’s deportation rate is behind that of the Bush administration at 800,863 per year as compared to Bush’s 1,291,106 per year. However, both are eclipsed by Clinton’s record of 1,536,363 illegals deported annually. It appears the deportation process has been slowed in part by an act passed during the Bush administration in 2008 which puts unaccompanied children under the care of the Department of Health and Human Services. The Obama administration has indicated that it wants that bill amended to empower Border Patrol agents to expedite the deportation process. Many complain that illegals should just go back home and apply to come here the legal way. However, while in Mexico doing the television documentary, my friend Randy Stufflebeam was shown visa applications from as long as 20 years ago that are still waiting to be processed. I haven’t done the research to determine just how systemic this is, but if the visa application system is as “screwed up” as Randy says, then this would also be a factor in why people are coming here illegally as going through the legal channels would not necessarily be an option. I purposely put this one last because it’s what everyone thinks of first. In fact, it’s generally the only factor that anyone talks about or considers. Yes, border security does matter. If security were tight enough that no one ever got through, then eventually everyone would stop trying. However, so long as the other factors listed here remain in play, motivating people to come here for the welfare, for jobs, to escape poverty, or to flee from drug cartel violence, then it’s unlikely that any amount of border security will be sufficient to completely stem the tide. Certainly those who cross the border illegally are committing a crime and bear responsibility. The above list of contributing factors may help explain why illegal immigration is happening, but it doesn’t excuse it. But is anyone else responsible? Well, it’s the fundamental duty of the man in the Oval Office to uphold the laws of the land, secure the borders and protect the citizens – failure to do so makes a President worthy of being removed from office. However, that would apply to both this and the previous Presidents under whom the illegal alien population in America has steadily grown for a half-century. Given the multiple effects that America’s social welfare system has on the problem, the Congress and state legislatures that fund that system are also responsible. However, that would apply to both the Democrat controlled Congresses that have instituted welfare programs, the Republican controlled Congresses that have continued to fund them and the legislatures that propagate the welfare system at the state level. Considering that it is we, the American people, who have elected, reelected and reelected again the politicians of both dominant political parties who have presided over the never-ending wave of illegal immigration and have perpetuated the policies that are contributing to it, then at some point we have to say that we are responsible. Remember, nothing happens in a vacuum. We’re not experiencing a half century long, random act of spontaneous illegal immigration taking place due to some temporary lapse in the law of cause and effect. We live in a highly ordered universe created by an Intelligent Designer Who told us that neither He, nor the laws that He designed into His creation, will be mocked – what men sow, they will reap. If we’re reaping something that we don’t like, then somewhere along the way we’ve sown the wrong seed. We have sown the seed of being a nation that consumes such a large quantity of drugs that it has enriched the cartels that service our habit to the point that they can destabilize and spread a reign of violence over four sovereign nations. We have sown the seed of inordinate loyalty to two corrupt political parties, neither of which honors God nor follows the Constitution anymore. We have sown mindless, ditto-head following of talking heads and political isms that we let do our thinking for us so we don’t have to do the hard work of actually understanding the issues for ourselves. We have sown the forsaking of virtue and courage – voting for politicians who we know do not represent what is truly right, but we are afraid that the other big government, secular humanist, socialist, career politician might get in instead. We have even sown the seeds of hypocrisy as we angrily rage against one President or political party, then turn around and let ourselves be duped into supporting another that perpetuates most of the same policies. The real problem didn’t originate solely south of the border, nor entirely inside the beltway. Until we take responsibility for our own country’s spiritual and moral condition and for the results of our own political choices, no amount of complaining, marching in the streets or writing cards and letters to our Congressman is going to fix it. Let’s take responsibility, admit to God that we’ve screwed up, then ask Him to show us what seeds to start sowing so we can reap a better harvest. I’m always looking for the principle behind a thing, the key thing, the root thing, the thing that makes it all work. I can’t walk into a building without starting to analyze the structure to figure out which is a load-bearing wall, which is a facade, what holds this up and what supports that.I’m that way with politics and government too. I want to find the foundational principles that make for good government, the eternal truths that can tell me which policies are right or wrong. I want to make sure I’m getting to the root of the matter and am not being distracted by something superficial. I realize not everyone is like me and I don’t expect you to be. However, there are times in life when we absolutely must understand what is at the root of a matter and make sure we are dealing with it at the source. If not, we’ll be destined to futility in our dealings with it and we’ll never be able to fix it when it’s broken. Think about it – you don’t go to a doctor just to talk with him about how you feel, then have him give you something to relieve those symptoms. You go to a doctor to have him correctly diagnose the root cause of the symptoms so you can fix the problem at its source. Likewise, in matters of politics and civil government, we cannot afford to become distracted with superficial things that are mere symptoms of a more systemic, root matter. We risk getting caught up in treating the symptoms of our political ailment and failing to fight the disease at the root. I was recently reminded of the importance of understanding key issues, principles and underlying causes while reviewing an article by Memphis attorney and 2008 Constitution Party Vice Presidential nominee, Darrell Castle. In his article on “How the Republic Became a Monarchy,” Darrell went all the way back to President Woodrow Wilson, the 16th Amendment (the income tax) and the establishing of the Federal Reserve in order to show his readers how key things that happened 100 years ago are at the root of much of what we are dealing with today. I highly recommend a review of Darrell’s article, both for the sake of the information provided in it and as an exercise in learning to identify key issues that are at the root of our nation’s maladies. If you prefer, the same information is available as a four part series of audio podcasts (about 5 mins. each) at www.castlereport.us (Part 1 / Part 2 / Part 3 / Part 4). While I say this in love, seeking the best interest of my friends, brethren and fellow countrymen, I have to point out that the Christian-conervative-right has, in great part, lost sight of the key issues, root matters and foundational principles. We have become distracted with the symptoms of the diseases that plague our land and have come to devote the majority of our time and effort to suppressing the symptoms instead of eradicating the disease. The conservative movement has become like a man with a tree in his backyard that is producing poisonous fruit. His strategy is to grab a stick and start swinging at whatever piece of fruit happens to catch his eye, hoping to knock some of it off the branch before it matures. But no matter how frantically he swings at the fruit, it keeps coming back faster than he can knock it down. He has become so distracted by his frenzied fight with the fruit on the branches that he fails to notice the root feeding the tree. 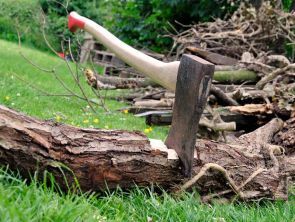 If he would just take an ax and start chopping off the roots instead, he could rid himself of all the toxic fruit. Let’s look at just a few examples of key issues, root causes and foundational principles versus distractions and treating the symptoms. How much time and energy did the conservative movement expend fighting to get, and later to keep, the so called “Bush tax cuts”? By the attention given to them, those tax cuts would appear to have been the conservative event of the decade and probably were the high water mark of conservative achievement during that period. But how much difference did those tax cuts actually make in your everyday life? How much more disposable income do you have now? The fact is that those tax cuts only made a few minor adjustments to a huge, complex and evil system of taxation that a Republican President and Republican controlled Congress had it in their power to abolish – possibly by repealing the 16th Amendment, but at least by defunding and dismantling the IRS. Conservatives heralded as a tremendous victory this barely discernible relief brought to just one of the nation’s multitude of maladies. But the conservative movement, as represented by those to whom it had handed the reins of power, utterly passed up the opportunity to lay the ax to a major root providing the revenues that feed a plethora of un-Constitutional branches of government. Conservatives spend massive amounts of time and energy fighting policies and agendas that come down through a vast maze of un-Constitutional and extra-Constitutional bureaus, agencies and programs. All forms of federal taxation combined are not sufficient to support the heavy load of all these agencies and programs. In other words, these can only exist through deficit spending – deficit spending that is facilitated by the existence of the Federal Reserve and its ability to create fiat funny money out of thin air, backed by nothing. During the conservative reign of complete Republican control from 2000 to 2006, the President and Congress had it within their power to repeal the Federal Reserve Act and restore Constitutionally authorized money coined by Congress and backed by gold. This would have chopped off another major root that feeds the branches of un-Constitutional government through deficit spending. But who in the dominant conservative movement or the Republican Party even alluded to this possibility, much less called for it? This isn’t just happening at the federal level. The distraction from key issues and fundamental principles is taking place in the states too. Today’s brand of conservatism at the state level seems to consist of contending for performance audits and better management of the state’s many Great Society, welfare and social services programs. Conservative law makers tout it as a great victory whenever they can sustain the current state programs and agencies without raising taxes. But if the conservative movement were remembering its origins in the principles of liberty and limited government in the spirit of the American founders, it would be contending for the complete defunding and dismantling of every one of those socialist programs. And in case you think it’s the Democrats that won’t let them do it, keep in mind that fully half of the states are currently under complete Republican control with a majority in both houses and the governorship. Just the other day, I received an email from a “conservative” legislator representing one of the most conservative districts in my state. One of the bragging points in his legislative report was that he had brought home the bacon to the tune of $1million for a “skills center” (aka vocational school). This is a foray by government into an area of education where many privately operated vocational schools and technical institutes have been meeting the need quite well. This is governments’ making the conscious choice to go into competition with existing private sector business and doing so with the advantage of being taxpayer-subsidized. Today’s “new conservatism” boasts that it brings home the bacon, gets us our “fair share” from the bucket of socialist slop and, by the way, it pats us on the back for being fiscally responsible, bragging that our “skills” center has the lowest cost per square foot of any similar socialist program across the state – boy, aren’t we conservative! The Republicans are not in the majority in my state and may not have had anything to do with funding this particular program, but it’s sad when the best that the new conservatism can do is to congratulate ourselves as to what fiscally responsible socialists we are. Even if a legislator is not in a position to eliminate such socialistic programs from the state’s budget, couldn’t he, we, or the conservative movement, at least use an occasion like this as an opportunity to share a lesson on fundamental principles of liberty, limited government, private sector free enterprise and Biblical jurisdictions? How is anyone going to learn to discern socialism from liberty, or know that it’s bad and why it’s wrong when “conservative” legislators don’t speak out against it? These are just a few examples that show us that the conservative movement has become distracted from the key issues and root matters and has ceased fighting the disease and settled for treating the symptoms instead. The new conservatism, as manifested by the Republican Party at least, now accepts socialism and prides itself on being able to make un-Constitutional, secular humanist, socialist, big government work better than the other party. May I challenge us to begin scrutinizing every political issue to discern the difference between key issues and mere distractions. Darrell Castle’s news and commentary podcsats can help with this. It only takes 5 minutes every Monday, Wednesday and Friday at www.castlereport.us. Then, once we’ve learned to tell the difference between the root and the fruit, let’s grab our ax and start chopping at the root. Bob Peck is the writer of the American Perspective blog – Politics, government and society from a Christian and Constitutional perspective. He is currently serving as Chairman of the Constitution Party of Washington, and is the Senior Coordinator of the national CP Multimedia Group, his specialties being videographing and podcasting. You can read more of his work at: bobpeck.wordpress.com. The other night I ran across a Facebook page titled “Draft Judge Andrew Napolitano for President.” I found that it is associated with a website devoted to the same purpose of convincing the judge to seek the Presidency in 2016. 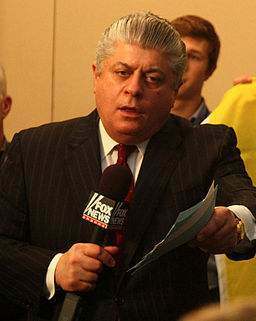 I like Judge Napolitano. I’m not aware of his having ever said anything that I disagree with and I would be pleased to have him as President. However, I have one problem with this effort. Excuse me, but how exactly is seeking the Republican nomination an act of going outside the controlled Establishment and special interests? The “R&D” duopoly are the epitome of controlled, insider, Establishment politics that’s bought and paid for by power brokers and special interests. Have we learned nothing after twice watching the “R” party leadership lie, cheat, steal and do whatever it had to to prevent Ron Paul, a Constitutionally sound and courageous candidate that they cannot control, from getting the nomination? And have we learned nothing after watching the same party subvert the campaigns of similar men of principle at the state and local level? Election cycle after election cycle I’ve watched as the “R” party Establishment leadership works to undermine the campaigns of any overtly God-honoring, Constitution-upholding, liberty-loving candidates in the primary election. I’ve heard story after story of the shenanigans pulled by the party leadership to push the Establishment choice through the nomination process, will of the membership be damned. When the occasional God honoring patriot makes it through the primary, the party has been known to actually undermine that candidate’s campaign in the general election, preferring a Democrat who will maintain the status quo over a man of courage and integrity who will uphold the Constitution and rock the Establishment’s boat. Even on the really rare occasion that a Constitutionist does get elected and goes to Congress, or the state legislature, they find their endeavors to honor God and uphold the Constitution opposed and thwarted by their own party’s leadership. They might as well have been elected and served as Democrats. So what am I suggesting – that the judge run on a third party ticket, or as an independent? That’s exactly what I’m suggesting. “Oh, but a third party or independent candidate can’t win” you might say. Well wake up – have any overtly God honoring, strict Constitutionists who are sincerely contending for liberty won as Republicans? Well, about a half dozen or so have won in Congress and the numbers are about the same in most state legislatures. But I expect that many of those candidates would have won as independents or third party candidates based on their local name recognition and reputation. If the local folks who agree with a candidate’s views would simply give them the same support without regard for party label, then I’m confident that most would have won even as third party or independent candidates. But why not run as a Republican? Because every time a good man, with good values, who honors God, upholds the Constitution and contends for the real principles of liberty runs as a Republican, he lends his credibility as a Christian and a Constitutionist to a party that has become anything but Christian and Constitutional. Now I realize that there are a lot of nice Christian people still trapped in the Republican Party and I know that people will point out that the Republican Party has a good platform. But did Jesus say we should know a tree by its leaves or by its fruit (Mat 7:15-20)? The Republican Party may have a lot of nice Christian leaves (members) and be cloaked in a quite conservative platform, but the only test that I’ve been instructed to judge a thing by is the fruit that it produces. So what fruit has the Republican Party produced? Now before you say “oh, but those pesky Democrats won’t let the Republicans do anything good,” let’s stop and consider that over the last quarter century that I’ve been paying attention to the affairs of government, the “R” party has been in power about half the time. They have held the Presidency with a Democrat controlled Congress (1988-92), they have controlled Congress under a Democrat President (1994-2000), they had the whole enchilada from 2000-06 and even now they control the branch of the federal government responsible for all bills for revenue and thus have full control over the nation’s spending habits. The “R” party also controls fully half of the union states with 25 states having both an “R” majority in the legislature and an “R” governor. Despite all this opportunity, can you name for me one time that the Republican Party produced even one piece of good, God honoring, Constitution upholding, liberty restoring fruit? Can you name one time that the budget has been balanced, the borders secured, Constitutional money restored, abortion ended, foreign aid eliminated, foreign interventionism and international meddling ended…? Can you name one “R” party controlled state that has exercised its 10th Amendment rights and stood up to federal usurpation, nullified un-Constitutional federal acts or produced overtly God honoring, Constitution upholding fruits of liberty? It’s time to judge the tree by its fruit and the fruit is corrupt. But why not run as a Republican anyway per adventure the judge might have a little better chance of winning? Because every time that a good man associates himself with a corrupt entity, he lends his reputation to that entity and brings it credibility – credibility that causes well meaning Christians and conservatives to continue to be held hostage by a party that is only serving to shove toxic, bitter fruit down their throats. Running Constitutional candidates under the banner of an un-Constitutional party is only helping to deceive people into thinking that party is Constitutional. Running sincerely Godly candidates under that banner is only misleading people to perceive that party as Godly. It’s time to stop perpetuating the lie. It’s time to “Come out of her, my people” (Rev 18:4) and “Be ye not unequally yoked” (2 Cor 6:14) with an entity that is not even trying to go in the direction that Christians and conservatives claim to want to go. Am I saying the judge could win as an independent or third party candidate? Probably not – not without a major change in the spiritual condition and general moral climate of “we the people.” However, I expect he would have about as good a chance as he does of winning the Republican nomination. More importantly though, by refusing to associate himself with an entity that in truth does not represent Biblical values, Constitutional limits or the founding principles of liberty, the judge could help shake good people free from their dependency on, and captivity in, a party that truly is holding them hostage and exploiting them for nefarious purposes. I believe much more good could be accomplished by Judge Napolitano’s choosing to only associate himself with people and organizations of like mind who are sincerely committed to the principles and values of the American founders. I would recommend for the judge’s consideration, the Constitution Party, an organization that from its inception has held the values of the Founding Fathers as its guide. Associating with such an organization would be an equal yoking and would help bring attention to the principles and values that need to be restored in America rather than wasting a good man’s reputation on bringing credibility to a corrupt entity. Even running as an independent would help shake people loose from their political strain of Stockholm Syndrome that keeps them supporting their political captors. At a minimum, a high profile, Constitutionally credible candidate, running outside the Establishment duopoly would help shake the political powers that be and perhaps lessen their hold on power and their hold over the people. As much as I appreciate Judge Napolitano, if he chooses to run as a Republican, I won’t be able to bring myself to expend my effort in support of his campaign. Spending time, money or the reputation of a good man on anything associated with the “R” party would be tantamount to giving aid and comfort to the enemy. Let’s find courage – courage to stand and not bow to the power brokers and party bosses that tell us that we need them, their influence, their money or their party initial after our name. Let them be accursed along with their lust for power and their willingness to sell our American birthright of liberty to get it.